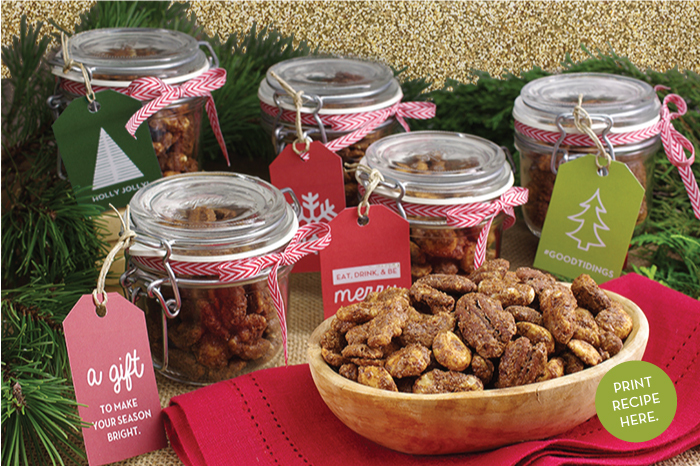 Gift a bag of these nuts, and you’ll suddenly be very popular! Ok, a bit dramatic, but we predict that recipients will enjoy them greatly, and will be asking you for the recipe! 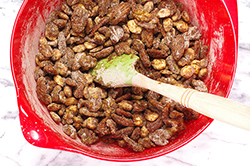 Or, simply make a batch of these nuts and have them around informally for gatherings. But watch out, they’re addictive! The combination of chocolate and coffee is a classic combo, but becomes even better when enhanced with some heat from cayenne pepper powder – just the right fiery kick for making these nuts irresistible! You’ll probably want to make a couple of batches of these nuts, but do so one at a time so that they’re not crowded on the roasting pan. 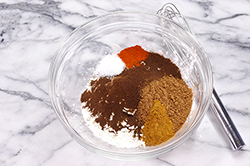 (1) In a medium bowl, combine the dry ingredients (sugar, cornstarch, cocoa powder, espresso powder, cinnamon, salt, and cayenne) until evenly mixed. 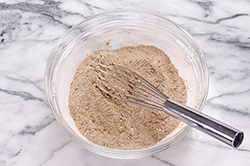 Sift if necessary to break up any lumps. Set aside. 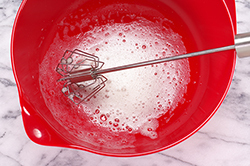 (2) In a larger bowl, beat the egg white until very frothy and broken up well, (but not as far as soft peaks). Stir in the vanilla. Add the nuts and stir gently until all are well coated. 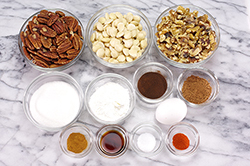 (3) Add the sugar-spice mixture to the nuts in two or three portions until evenly mixed. 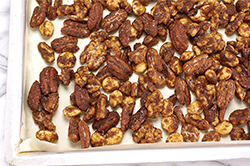 (4) Spread the coated, spiced nuts in a single layer on a rimmed, half-sheet baking pan lined with parchment paper. Keep the nuts separate from each other as much as possible. 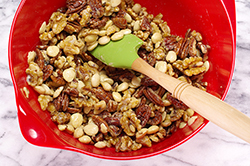 (5) Bake in a low temperature oven preheated to 225°F for 30 minutes, then gently stir and turn the nuts over. Bake for another 60 minutes, stirring and turning every 15 minutes. (7) Store in an airtight container for up to two weeks.